Sunday was Tess' birthday. I booked a theater package at a downtown hotel that included a night's lodging and two tickets the to The Sound of Music. Okay, I have to admit, I've never actually seen the movie or the play all the way through. It came out in 1965. We could rarely afford first run movies when I was growing up. When my parents did take us to a movie, it was a drive-in and it was usually a monster movie (there were three boys in our family and we were obsessed with classic horror). This is not to say that I don't know every song in the play and had a basic idea of what the plot was. You'd have to have been living in a cave for the last 40 years not to. When I was in sixth grade, I sang a solo of "Edelweiss" in a school music competition. I won a blue ribbon for it. This was before my voice changed. Though I can still belt out a fairly decent rendition of it that would bring tears to your eyes. So, anyway, I surprise Tess with the theater package and she seemed pleased. We checked into our hotel, changed into our theater clothes (yes, I wore a tie), had dinner at a nice restaurant downtown and then walked to the theater. I will be the first to admit that downtown Seattle really knows how to dress up for the holidays. There were Christmas lights everywhere and a carousel in Westlake Park. It was a clear, crisp night and we enjoyed the store windows as we strolled up 5th avenue towards the theater where the Sound of Music was showing. Fifth Avenue is considered Seattle's "uptown" and is pretty posh compared to the other downtown areas. You can walk along there and imagine you are in New York or Chicago. And the 5th Avenue Theater is a pretty cool place to watch a show. It was built in the 1920s as a vaudeville and silent movie theater. It's got the whole Asian theme going with elaborate carvings of dragons and stone lanterns. Give me a vintage theater any day over the 40-plexes they build today for movies. My only real pet peeve about theater is Seattle is that people don't dress up for it. I mean, we are talking about Broadway productions here, not dinner theater at the community college. So when I see some dimwit in sweats and tennis shoes bitching because he can't take food into the auditorium, it kind of puts a damper on the whole illusion that we are attending opening night in New York. Maybe it was the bottle of wine at dinner or the pre-dinner martini. Or maybe it was the holiday season and Tess' birthday celebration, but I was able to more or less ignore the slovenly dressed theater goers and enjoy the show. After all, who hasn't sang, "Do, Re, Mi" once in their lifetime? But it did strike me how dated some of the dialogue was in the storyline. There was one point when Captain Von Trapp is trying to decide whether he should accept an offer he couldn't refuse from the Nazi navy to captain a ship or take his family and run. He asks Maria what he should do and she relies, "Whatever you decide is my decision, too." Now there is an attitude that doesn't quite fit with the modern definition of marriage. I suggested to Tess that that was a pretty refreshing sentiment and she squeezed my hand really, really hard. I suppose one shouldn't try to read too much into a Rogers and Hammerstein musical. After all these are the same guys who wrote, "There is nothing like a dame," for South Pacific. Regardless, we enjoyed the show. And I think Tess enjoyed her birthday. That's what is important. Now if I can just get that "Lonely Goatherd" song out of my head. Let me know how that works out. 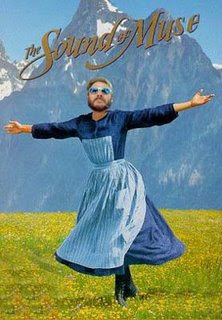 Because the hills may be alive with more than the sound of music. I've always liked live theater. Usually great fun. And I've seen a performance of South Pacific at a dinner theater. I've never seen Sound of Music tho. But every time I hear of it I think of Julie Andrews flashing her breasts in SOB. (Fantastic film) Guess that goes to show where my mind is. Okay, Lights, I'm going to talk you through this. South Pacific dinner theater...well, that's just wrong. I can only imagine the rendition of "Happy Talk." But fixating on Julie Andrews breasts in SOB. Get a grip, man, she may have been Mary Poppins, but she has to be in her 70s now. Let's just step away from the show tunes and get back to cleaning that house of yours. What a beautiful night. In high school there were a couple of guys that I dated that would plan this type of night; unfortunately I haven't had that sense. I agree with you here. This is an occasion that requires dressing up. It add to the whole experience. On of my greatest memories of my ex husband was dressing in formal attire to see "The Phantom of the Opera". It was in celebration of the impending birth of our son. I think it shows great respect to the performers and an appreciation for their art to treat it as something special. Good for you! I like to dress up on occasion. Don't tell Michael, but I have my own tux.